In the early 1950's the fishing industry was revolutionized by the introduction of synthetic fibers into the net manufacturing process. Nylon was the first to be widely used in the manufacture of fishing nets, but several other fibers have since become quite important. For thousands of years, before the introduction of synthetics, fishing nets were made of natural fibers, mainly cotton, linen, flax and sisal. These fibers presented the fishermen with many problems; they rotted easily, absorbed much water during use, and demanded constant attention. Caring for his nets took so much of the fisherman's time that there was relatively little left for the actual business of fishing. With the introduction of synthetic fibers, all this changed. Nets made of synthetics do not absorb water, do not rot, and are stronger, lighter and easier to handle than those made of natural fibers. The savings to the fisherman in time, energy and money have been tremendous. Efficiency has improved, and catches have increased to the point where fishing is now one of the world's most important industries. Nowadays the great majority of fishing nets are made of synthetic fibers. Multifilament yarns Nylon, Polyester, Polyethylene, etc. Natural fibers are now rarely used. Cotton, Manila, Flax, Linen, etc. Before examining synthetic raw materials, we must explain the term "denier", which is used to specify continuous filament synthetic fibers. Therefore, a multifilament fiber 9,000 meters long, weighing 3 grams = 3 denier (3d). Likewise a fiber 9,000 meters long and weighing 210 grams = 210 denier (210d). The higher the "d" number the thicker the filaments are. So, a 420d fiber is twice as thick as a 210d fiber. Before discussing Vinylon, which is a "cut" fiber, we must explain the term "count". 1. Continuous filament fibers, including all synthetic multifilament and monofilament fibers and 2. Cut fibers, including all natural fibers, as well as Vinylon, cut Nylon, Cut Polyester, etc. Therefore, a fiber which weights one pound and 8,200 yards long = 10 count (10c). Likewise a fiber which weighs one pound and is 16,800 yards long = 20 count (20c). It is clear that the higher the "count" number the finer the fibers are. In other words, a 10 count fiber is twice as thick as a 20 count fiber. Though other considerations such as fiber strength, flexibility and durability are usually most important, the specific gravities of synthetic fibers should also be considered when choosing a fiber for twines or nets. The specific gravity of any fiber indicates its weight in relation to the weight of water. Water has a specific gravity of 1.00. Any fiber with a specific gravity greater than 1.00 will not float, in water, while a fiber with a specific gravity less than 1.00 will. Below are the specific gravities of the synthetic fibers most commonly used in twines and fishing nets, plus those of certain relatively important natural fibers. Both types are readily available all over the world. Of these, 210d is, by far, the most commonly used and important. 210d yarn is usually composed of 24 filaments. Nylon Monofilament lines are produced in a way very similar, in principle, to that by which Nylon Multifilament yarns are produced. The technique is called extrusion. There is a great difference, in the relative scale of each operation. Where the production of multifilament requires a very large-scale operation and tremendous space and facilities, monofilament can easily be produced by a relatively small- scale operation. N.B. Nylon Monofilament lines are specified by diameter. Polyethylene, like Nylon Monofilament, is produced through a small scale extrusion process. Although it is a monofilament, it is specified according to denier. This is because one Polyethylene line is, by itself, relatively weak. It is therefore never used for fishing in this form. Instead, Polyethylene lines are always twisted or braided. Polyester is similar to Nylon Multifilament in appearance. And it is used, almost always, in multifilament form. Vinylon, a fiber invented in Japan, is currently only manufactured in Japan and The People's Republic of China. It is a cut fiber and is similar to cotton in appearance. In order to manufacture finished netting, the basics raw material must first be transformed into a workable form, that is, "twine". Secondary Twisting of strands into twines. Twines may be twisted in one of two directions "Left" (L) or "Right" (R). Traditionally, twines used for the manufacture of fishing nets receive a "Left" (L) twist. 420d/6 R2 (or 420d/6 S2) this twine would be identical to 210d/12 R .
1260/9 L3 (or 1260/9 Z3) this twine would be identical to 210d/54 L3. 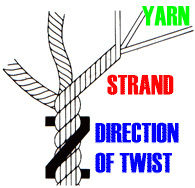 Primary twisting 3 lengths of 210d multifilament yarns are twisted "Right" (R) into strands. Secondary twisting 3 of these strands are then twisted "Left" (L), into twines. The finished twines are then wound on a Winding Machine into "cheese", "cone", or "hank" ready for further production or delivery. The double knot is used primarily in gill netting. This is because, in gill net fishing, fish are caught and entangled in the mesh. It is essential in this case that the knots do not slip. Therefore, the tighter double knot is used. The single knot is used in all other types of netting. Purse and beach seine, trawl and stationary. by measuring the distance from one knot of the mesh to a neighboring knot, in millimeters (half-mesh). Measured stretched, in meters, yards, or feet. Specified as "single" selvage or "double" selvage. Netting may be dyed to any color.